I haven’t slept in days and it’s all Meg Cabot’s fault. Her latest novel, Royal Wedding, is just too good. How could I let something as trivial as sleep get in the way of finishing it? Royal Wedding—the 11th Princess Diaries novel and the first for adults—reunites us with Mia Thermopolis, who many of us know from the YA series or the Anne Hathaway movies (which are absolutely delightful but do stray from the books, just FYI). Now 26, the Princess of Genovia is juggling her royal responsibilities, her work at a community center, and her seriously-how-cute-are-they relationship with Michael Moscovitz. (LOVE HIM!) Throw in some newly-surfaced family secrets, drama with her parents and grandmother, and non-stop coverage by the royal-ranking paparazzi and it’s amazing that Mia is even standing. But stand she does, in a funny, heartfelt and totally delicious journey that I never wanted to see end. Oh, and, as you might have guessed from the title, Mia and Michael are totally getting married—so move over Will and Kate! 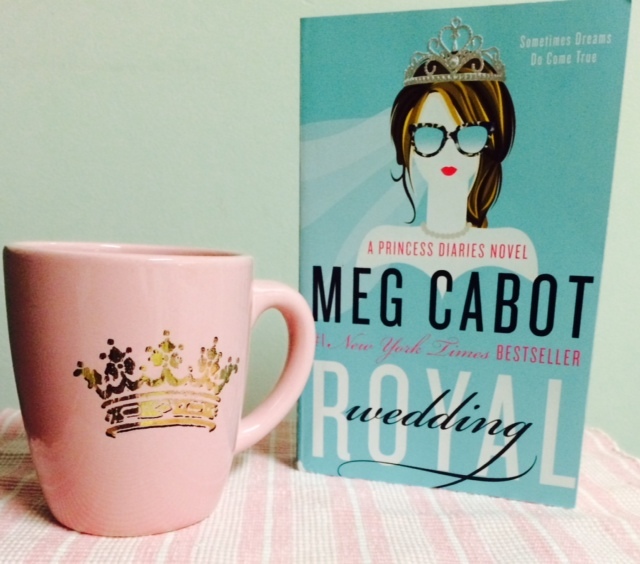 Here’s what’s so fantastic about Meg Cabot’s writing: It’s utterly, unmistakably Meg Cabot. Her characters, their thoughts and habits (Buffy marathons, anyone?) are so true, real and original to who they are that they could never be confused with another author’s creations. From page one, I want to be Princess Mia’s best friend, and feel so fortunate (if a bit intrusive) to be privy to all of the secrets she confesses in her diary. I adore her, just as I adore her over-the-top, unpredictable Grandmere, her kinda-bossy BFF Lilly, and even former mean girl turned friend(ish) Lana. And in case I haven’t mentioned, I also adore Michael Moscovitz—the most adorable fiancé ever! Royal Wedding has so much heart. It’s funny, it’s sweet, and it’s romantic in the most down-to-earth, relatable way possible—which may seem hard to fathom, considering that we’re dealing with super famous royalty here. It is the perfect book to read by the pool, on the beach, or anywhere you can steal five minutes for one more chapter. If you haven’t read the earlier Princess Diaries books, never fear. This book stands on its own, and you can dive right in with Mia, Michael (swoon) and the rest. This is a can’t-miss novel for anyone looking for a fun escape with wonderful characters, a captivating story and more than a few laugh-out-loud moments. My only wish? That there were four hundred more pages, because I never wanted to reach the end. Sure, that might mean a few more sleepless nights, but who needs sleep when you’ve got Meg Cabot’s Genovia to get you through the day? For more on Meg Cabot and her beyond wonderful books, visit megcabot.com and don’t forget to follow her on Facebook and Twitter. Want to keep dishing about great summer reads? Connect with Book Perfume on Facebook and Twitter and let’s talk books! Great review. I was wondering if I could start with this book (never read anything in the series) and it sounds like I can! Yes! You definitely can. Happy reading!! !